High blood pressure, also known as hypertension, is an extremely common ailment that affects about 75 million people, according to the Centers for Disease Control and Prevention. Still, there are some populations that have an increased risk for hypertension including African-Americans, older adults and pregnant women. These groups are not only more vulnerable to developing high blood pressure, but can see serious complications from it as well, said Dr. Valeriani Bead, a cardiologist at the MedStar Heart & Vascular Institute. A change in hypertension guidelines in 2018 means that even more Americans, including these most at-risk groups, will be diagnosed with the condition. The new guidelines from the American Heart Association and the American College of Cardiology lowered the target rate of blood pressure for average-risk individuals to 120/80 millimeters of mercury or less. In the past, the target rate was 130/80 millimeters of mercury or less. “More American adults will be told they have high blood pressure because of these newer thresholds, and those who are already being treated will really need to talk with their health care providers about whether or not their target blood pressure readings need to be adjusted and in some cases, if their lifestyle changes or medication will need to be intensified,” Dr. Bead said. Common symptoms associated with high blood pressure include headaches, dizziness and fatigue. In some cases there can be chest pain or shortness of breath, Dr. Bead said. In the United States, African Americans have a higher prevalence of hypertension than any other subgroup defined by race, Dr. Bead said. “Identifying and treating hypertension can have such a significant impact on health and morbidity in the African American community, which is why it should be identified much earlier,” Dr. Bead said. High blood pressure is also extremely common in older adults. While the exact reason is unknown, it may be because as we age, our blood vessels get stiffer, which can cause the heart to pump blood harder. This results in elevated blood pressure, Dr. Bead said. Pregnant women are another at-risk group, Dr. Bead said. 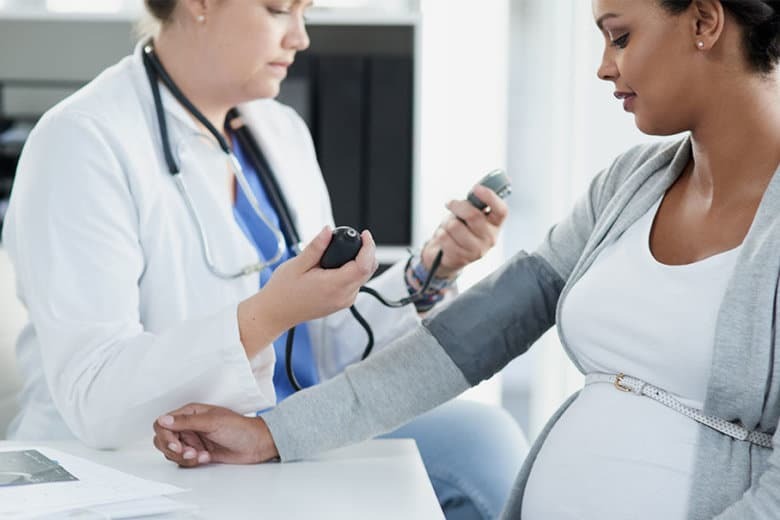 During a woman’s second or third trimester, blood pressure can often rise, putting the mother and her child in danger. A pregnant woman with high blood pressure could have congestive heart failure, he added. There can be serious consequences if high blood pressure is not addressed and managed. Dr. Bead recommends recognizing the symptoms of hypertension and seeing a doctor to treat it earlier and minimize any consequences. High blood pressure can often be treated through lifestyle changes. For example, exercising more, eating better, quitting smoking and limiting alcohol. The first line treatment is always lifestyle changes; the second is medication, Dr. Bead said. Sometimes patients may need to take two medications at the same time to reach their goal blood pressure. In extreme cases of hypertension, there are invasive procedures available, but patients should talk with their doctors and rule out any other causes for their high blood pressure first. Read more and listen to a podcast with Dr. Bead here.